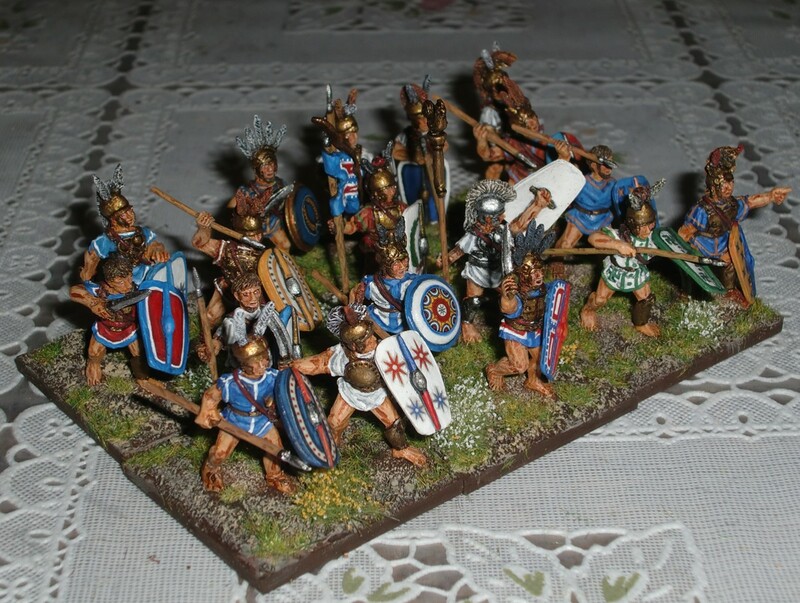 Nothing new on the gaming or painting front, but just a bit of rebasing figures painted many moons ago. These are Redoubt Oscans/Samnites and also Foundry and 1st Corps Hypaspists. They were previously based as singles for WAB and the like. I was never happy with the way the Hypaspists were ranked up with their lunging and hurling spear poses. They looked way too tightly packed together. Since I don't like individual casualty removal, figured they're just as well be based more in an open order way. All of these figures are on 40mm Litko squares - three figures per base. As I only wanted six bases for the Hypaspists, the spares were put on a round command base with a spare standard bearer. 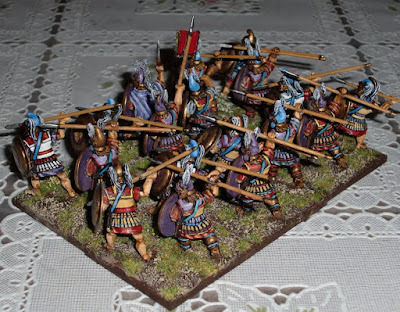 Close-ups of the Redoubt Oscan/Samnites. 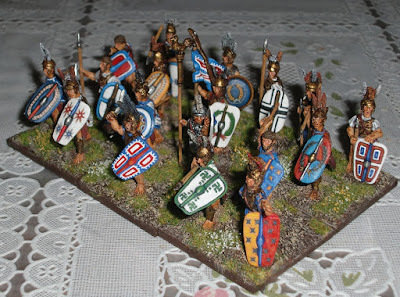 The shield designs are a combination of LBMS transfers and free hand painting. Next up the Foundry and 1st Corps Hypaspists. LBMS transfers are used. The standard has a decal from VVV. The two makers work well together; the Foundry guys are bare-legged while the 1st Corps guys have greaves. Again, all of these figures were painted a long time ago, but I don't think they were posted before on this blog - not close-ups anyway. As far as gaming goes, I actually feel like a burden has been lifted off of my shoulders. At last month's Enfilade! convention I sold off a lot of figures - most of my WHFB Empire foot, all of my Napoleonic Russians and Prussians, all of the Old Glory Biblicals, and all of the WW1 French and Germans. 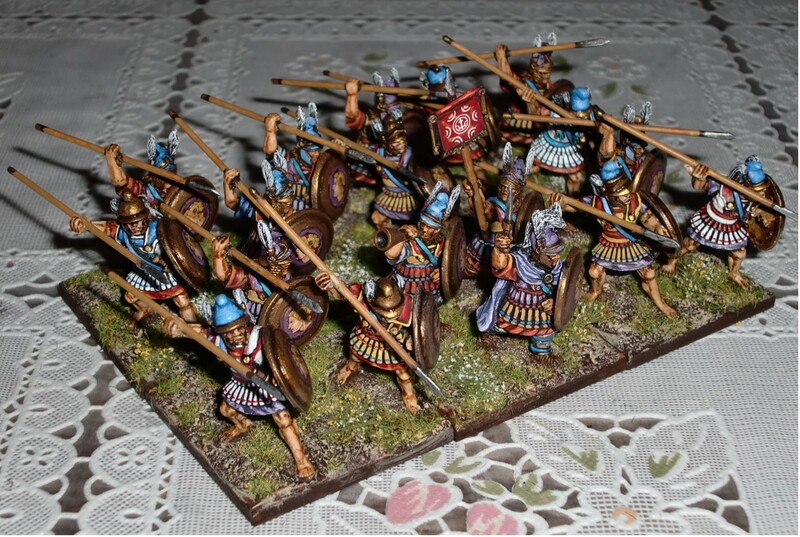 I also made private sales of some of my Napoleonic British (Perry Coldstream Guards and Household cav, and OG 71st Highlanders), some of the French (all of the OG infantry and Front Rank Dutch Lancers and Chasseurs a Cheval) and also a fair number of my Ancients collection (all of the OG and 1st Corps Hoplites; the OG Gallic infantry, Gallic and Scythian cav, A&A Companion cav, and Spanish Scutarii). 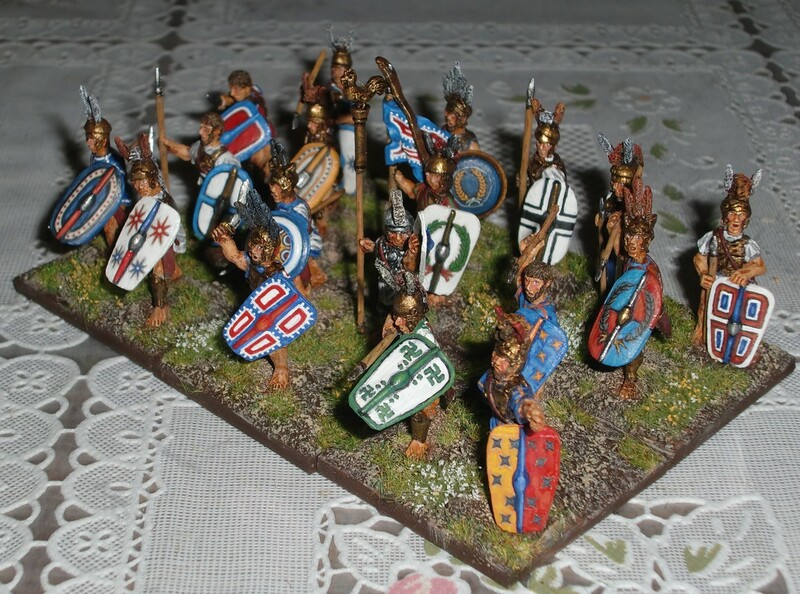 I had sold off a plastic EIR army as well as some Medieval and Dark Age cav at last year's con. As you may see, I've hyperlinked to images of the figures for my own future reference/regrets :). The pricing was low, but since everything was sold to folks in the local community I am quite content. 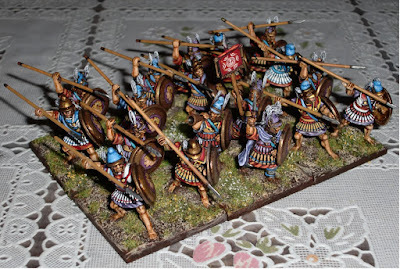 So far, I have kept all of my Trojan War stuff, all of the Samurai and Choson Koreans, the Napoleonic Victrix and most of the Perry, most of the Foundry Macedonians (like these Hypaspists), all of the Medievals and Dark Age Normans and Saxons, as well as the F&IW, Meiji/RJW Japanese, Gladiator and WW2 stuff. I now feel more focused and may even start hosting some games again.